Last May I had the opportunity to attend Paris Healthcare Week, the annual French event for decision-makers and healthcare professionals involved in the management, connection, equipment, and construction of healthcare facilities. In addition to visiting with my colleagues who were exhibiting there, I planned to attend several conferences organized by the International Union of Architects (UIA). In reality, since I was still not that familiar with healthcare facilities, my goal was to broaden my knowledge of this sector and its challenges, participants, and professions. I also wanted to learn more about current and coming trends in hospital architecture, and the roles that natural light and views could play. I was ultimately quite surprised to see natural light and views to the outdoors appear repeatedly as key design criteria in the various activities I encountered. Helping users to orient themselves and find their way through the space, thanks to more legible and intuitive signage: since healthcare facilities are often very large, with multiple floors, wings, and extensions, it’s not always easy for users to determine where they are and find their way around. This can be the case in particular for new visitors, patients with cognitive impairment, or elderly people with reduced mobility or poor vision. Bright spaces and enhanced views to the outdoors, combined with a well-planned choice of colors, contribute to users’ correct orientation and ability to find points of reference. We are therefore seeing more and more atriums and patios that create areas of light inside these spaces. Good signage also gives staff a clear view of internal organization and activity flows. 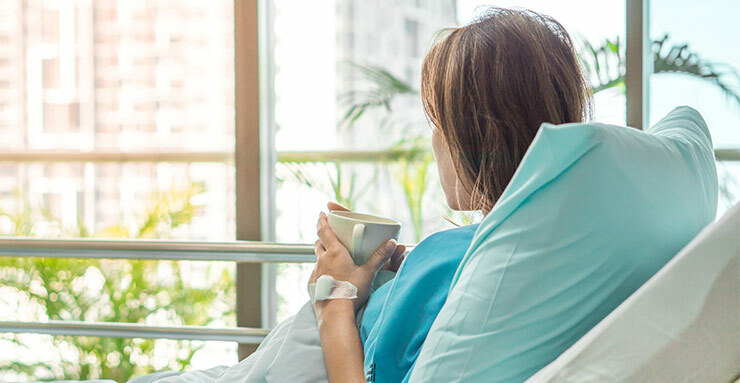 Reassuring patients and visitors: hospital environments are traditionally not seen as being very welcoming and can be a source of additional stress for visitors who are already anxious when they arrive. For example, the hallways of hospitals and emergency departments are often very compact and barely receive natural light. However, these spaces are the first areas of contact with patients and visitors! Psychologically, patients tend to determine the quality of a service or a healthcare professional based on the quality of the waiting room, including the lighting. Bringing natural light and views into these spaces as well is vital to improving the user’s experience. Creating comfortable, welcoming, high-quality spaces, similar to those in the hospitality market: one of the significant trends appearing in hospital architecture is the design of “hotel-type” spaces, which are warm, friendly, relaxing, with materials, colors, and ambiances based on the optimization of light and views. And this is true not only in the areas used for patients’ families, but also more generally in lobbies, waiting rooms, consulting rooms, and recovery areas. Increasing the attractiveness of the healthcare facility: one of the challenges for hospital administrators also lies in recruiting competent staff members and retaining them over time. One solution is to offer them a comfortable and pleasant work environment that allows them to work in the best possible conditions. Promoting biophilia: as the therapeutic effects of nature are becoming better known, open views into green spaces, for example, are being incorporated more frequently into both public and private spaces. Contributing to the facility’s sustainable development: energy and environmental performance is also a key challenge in healthcare facilities, and maximizing the use of natural light can contribute to reducing the use of electrical lighting and the building’s carbon footprint. Finally, it’s clear that, similar to office environments, the user is truly being repositioned at the heart of the architectural design for healthcare facilities, whether that user is a visitor, patient, family member, or staff member. In this context, natural light and outdoor views play a vital role. Biophilia in buildings: a way to get back in touch with Mother Nature for better health?